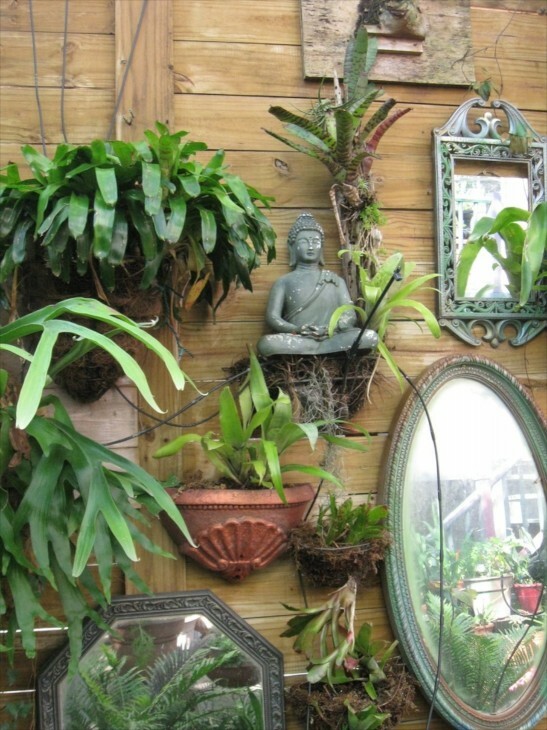 A pleasing combination of Asian inspired elements and eclectic decor items like the mirrors, with the plants-all attached to the fence to make it interesting for the homeowner or visitor. Somebody has imagination! This is a mix of things that ordinarily wouldn’t be put together, yet the arrangement is quit pleasing, again along a fence. Look closely and you will see an alligator hanging on the shutter, right next to a head of a child! 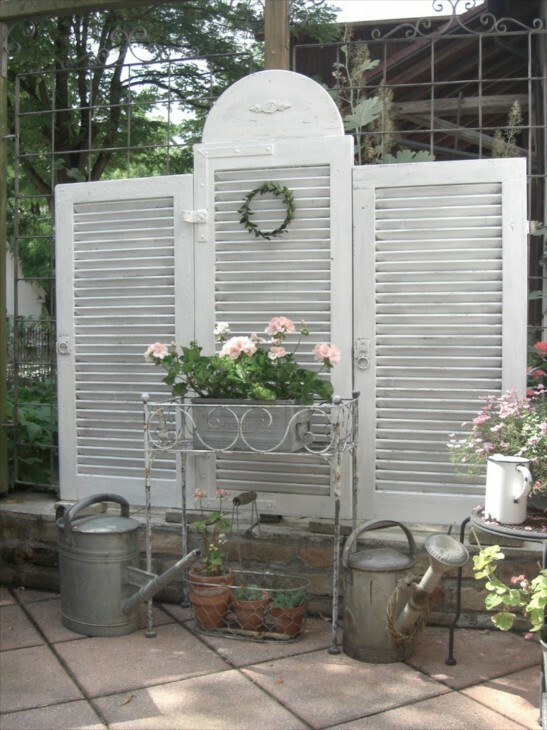 Look at the bottom of the shutter and there is a baby elephant statue and all sorts of quirky accessories. I really like this image. 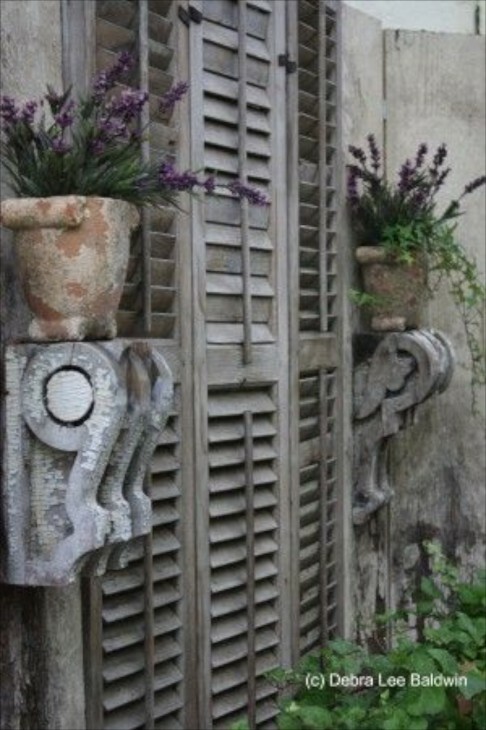 The old corbels flank an equally old shutter, and the grays are a perfect backdrop for the purple and green of the plants. 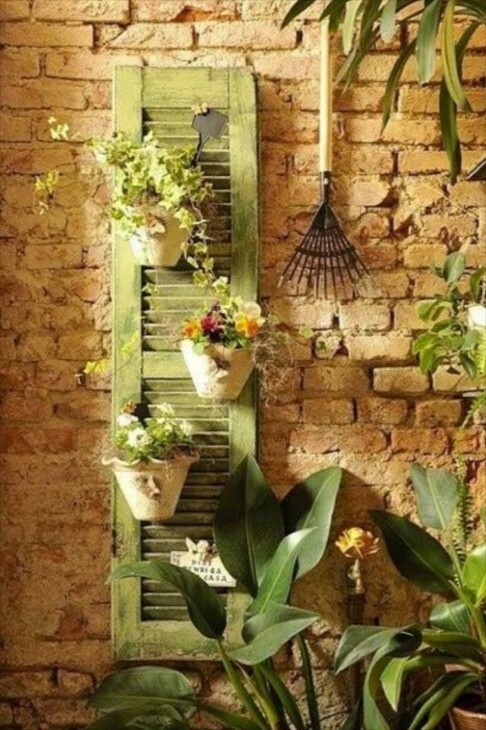 This certainly would not be an terribly attractive fence by itself, but with the simple addition of shutters and a plant stand, watering cans and a few plants, it is transformed. Now the metal fence behind actually is part of the vignette. 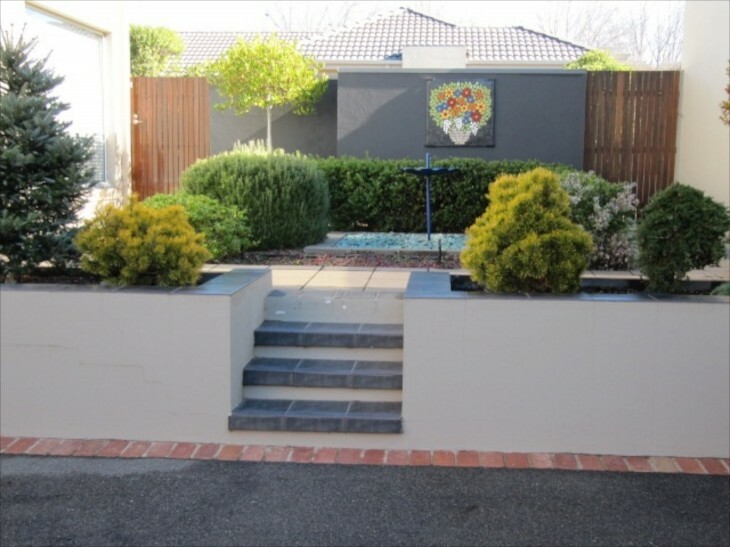 Imagine standing at the bottom of these stairs and facing the wall that connects the house to the garage without the shrubs or the singular yet colorful piece of art. It totally transforms the walk to with building. The clever use of a solid concrete wall placed in between the wood fencing acts like a frame for the art. 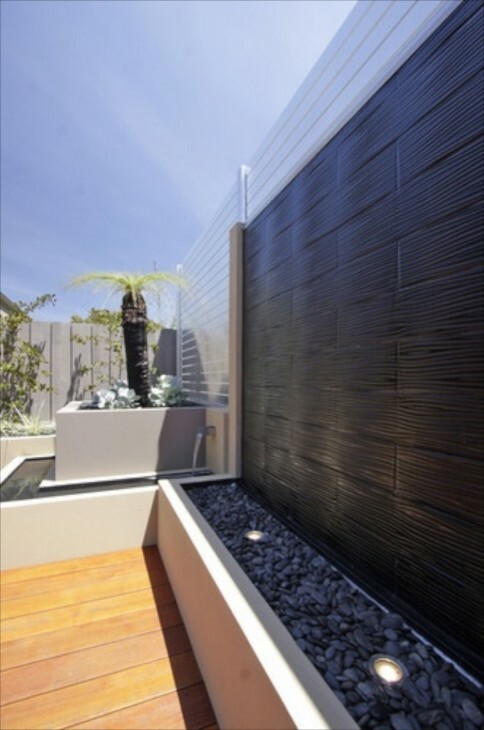 The gray wall is smooth while the fencing is highly textured, adding dimension and further interest. 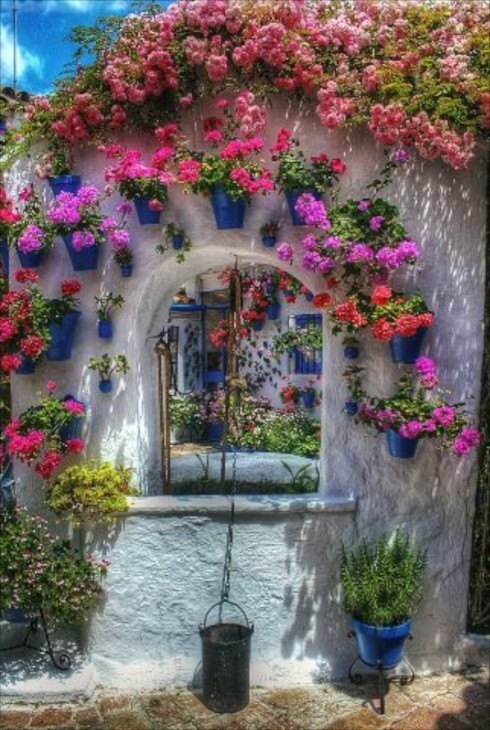 This looks to be a courtyard and it is certainly a happy way to welcome visitors from the street via a colorful walled entry. Without all this, it would be just another stuccoed wall. I am not sure that there can ever be too much color, but maybe so! However, all the color on the wall and the floor seems to be somewhat visually balanced by all blue pottery and just green and white plants, allowing the eyes to rest, even among all the pattern and color. 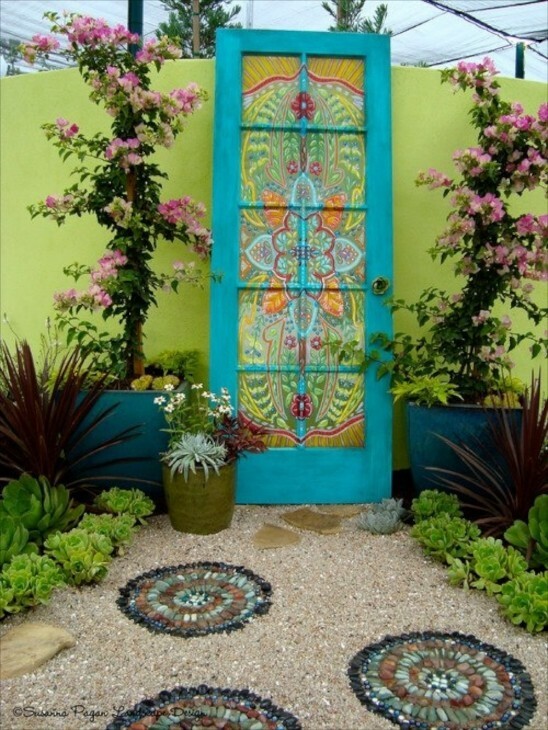 You have to imagine walking up to this door and having to smile….the mosaics are quite intricate as well. 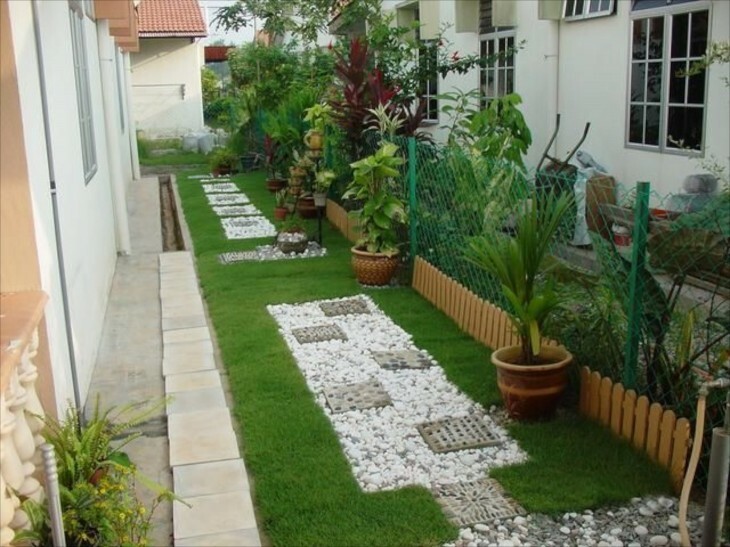 If you were walking between spaces in this yard, it would not be nearly so interesting as it is because the owners have chosen to break up a long brick wall with a lattice planter. Even in winter, if there are no flowers, it still will appear interesting. 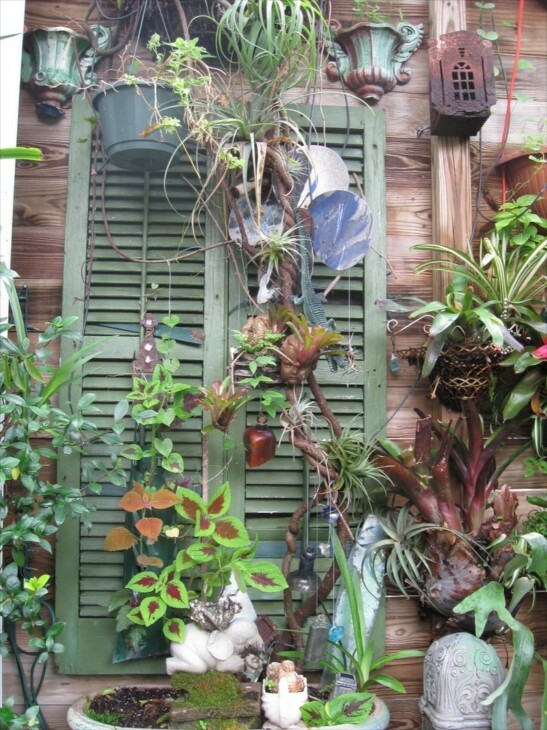 In between these very tall walls, containers add not just interest, but the varied plants add texture and beautiful, cooling variable green color. 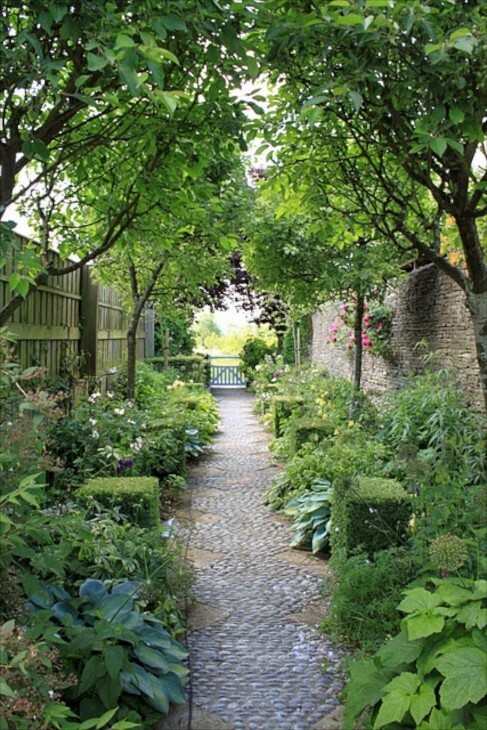 Although the stone path and beautiful walls are lovely, the walkway is greatly enhanced by these additions. 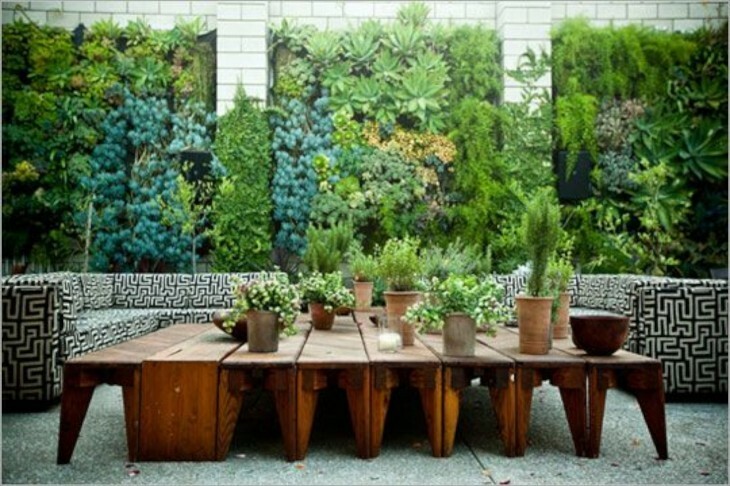 The taller evergreens and occasional vine climbing up the wall lower the wall visually. I just love this. What makes it work is the variation in the size of these simple framed boxes, and also all the containers being one color tone with an additional pop of white. 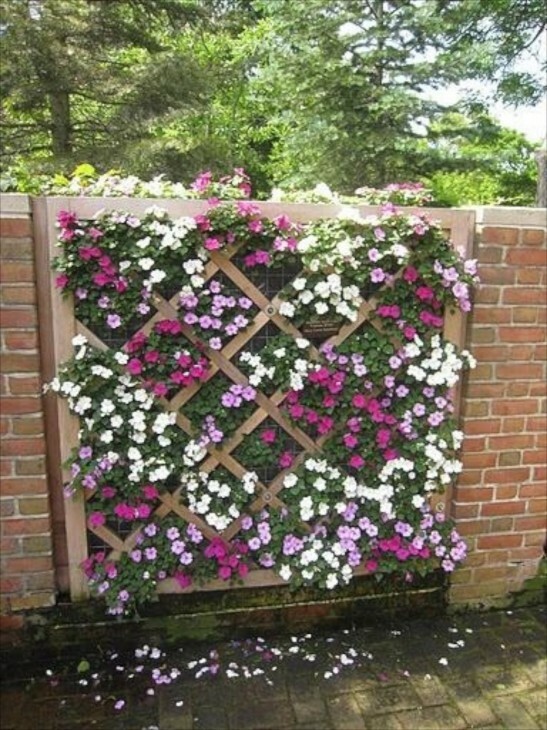 Beats a plain fence anyday. This is fun, colorful and chock full of texture and interest. 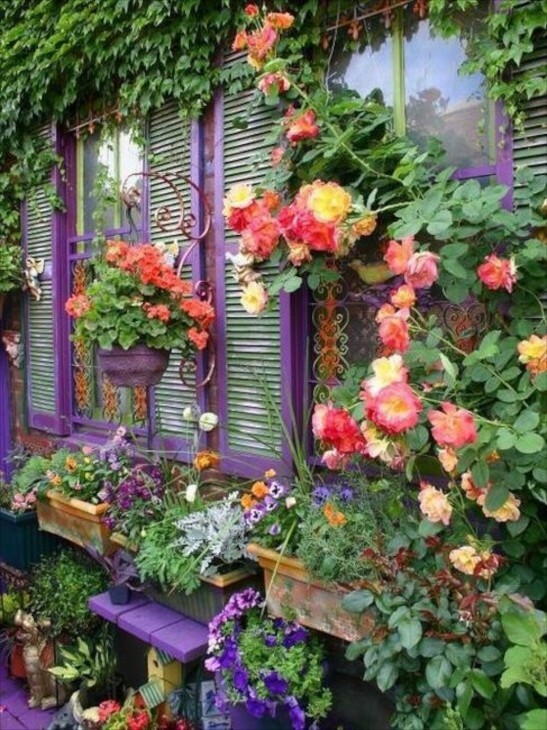 Old windows and shutters placed on the wall, with vines and climbing flowers, metal flowerpot hangers, together create a vignette in purple. Cute birdhouse and statuary underneath the flower boxes adds whimsy. 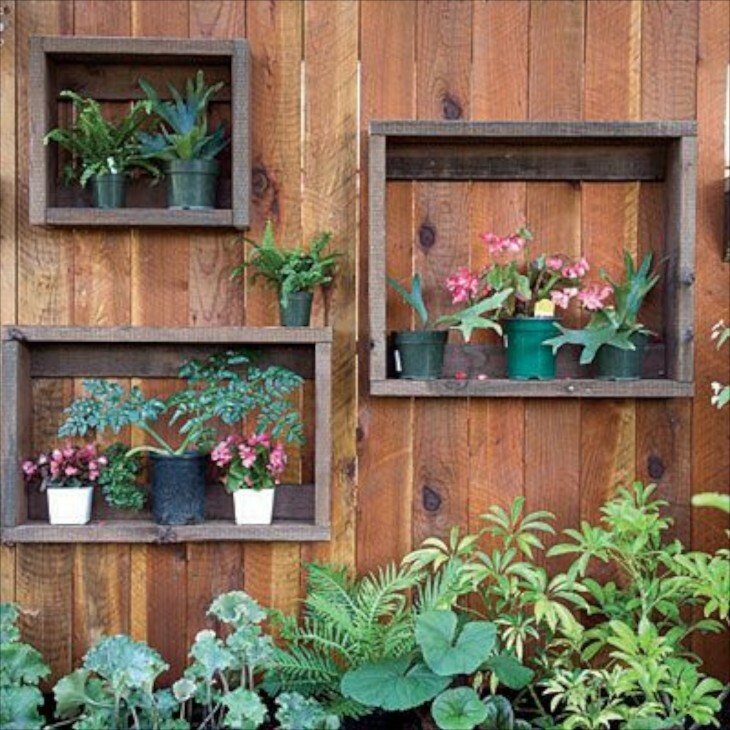 Another creative use of framed boxes along a fence wall, this a bit more complex than the one above. 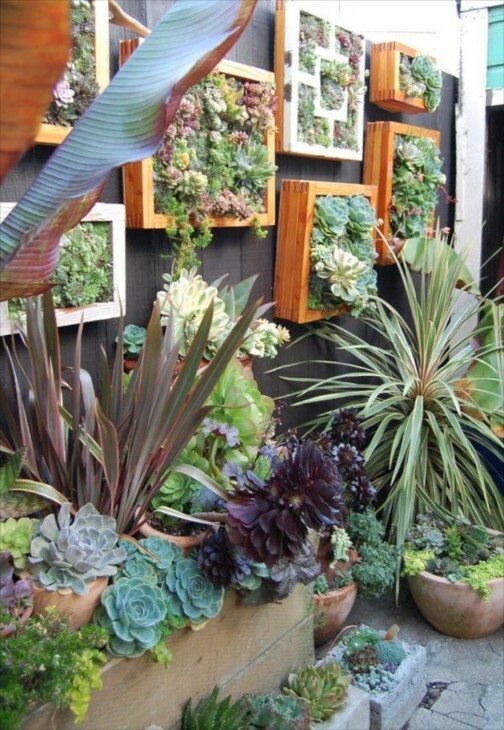 All the succulents and tropical plants add incredible texture, color and interest. 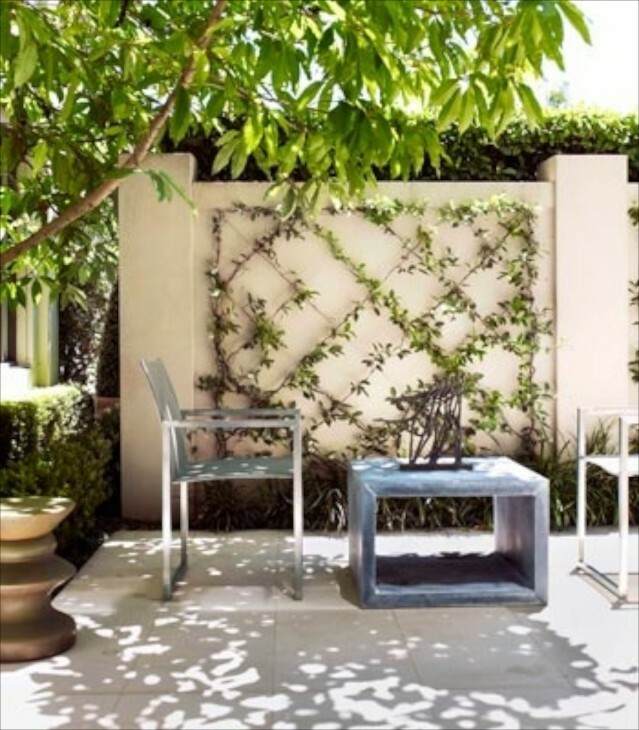 Here the owners created a privacy fence between garden and drive by using planting boxes with climbing vines to obscure the view as well as create a more intimate space. 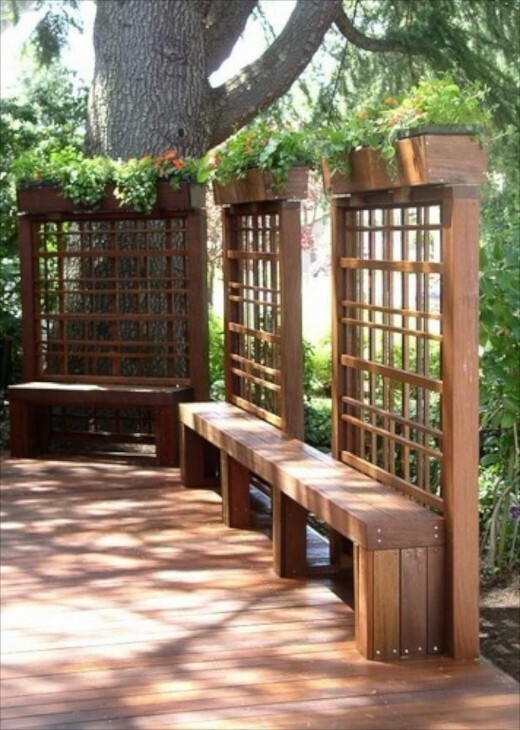 These owners did the same thing, but with the addition of benches, and by putting the flower boxes on top! 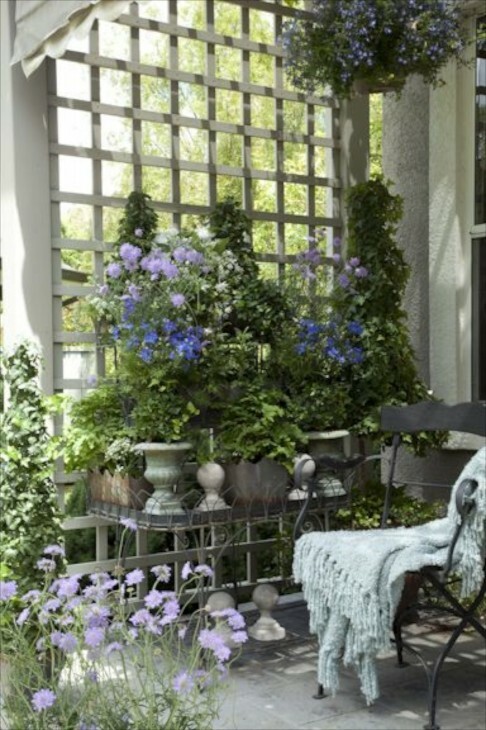 Instead of the usual open space on this porch, or the often used privacy curtain or shade, the easy addition of lattice and a metal table filled with blue and lavender plants makes for a more inviting and serene space. This space intrigues me. The plain white brick walls behind that amazing outdoor sectional, would be incredibly sterile without the plants. The combinations of blues and greens and different varieties of plants and shrubs appears almost like a giant work of art. You hardly notice the white of the wall now except as a welcome accent. I absolutely love the table and the placement of even more potted plants, yet still lots of room for people to sit and enjoy drinks and food. 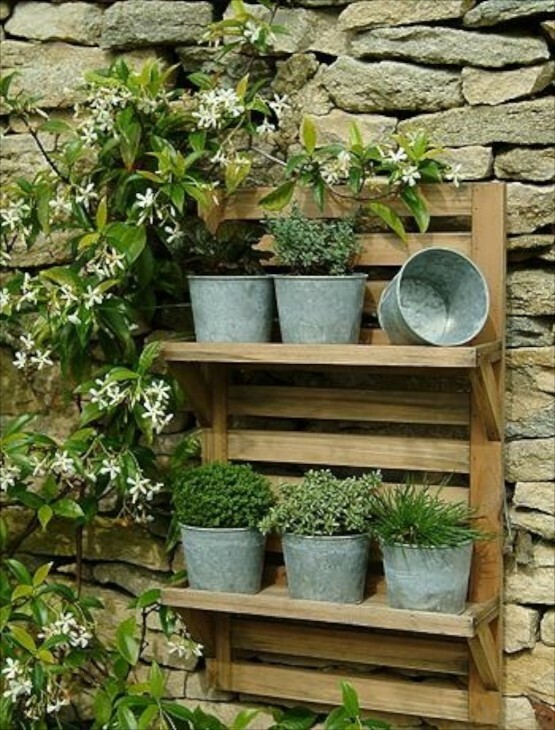 In a big space or a small space, adding this planter with herbs makes going between house and garden a pleasure. 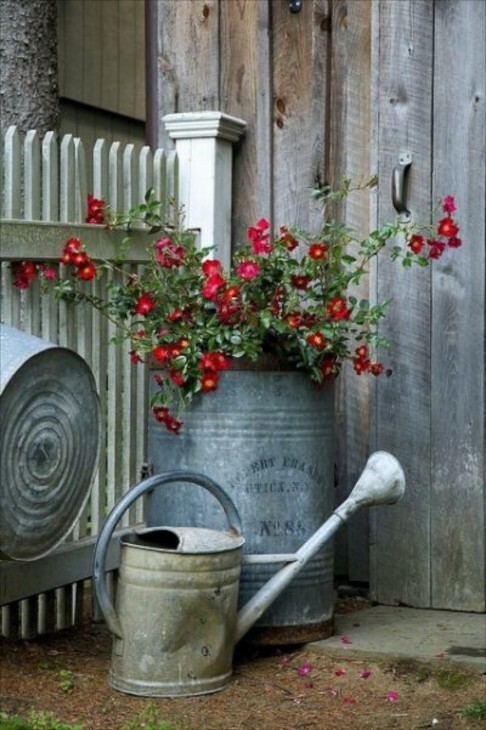 Notice the planting container is not wood. This would not be nearly as affective if the walls were white. 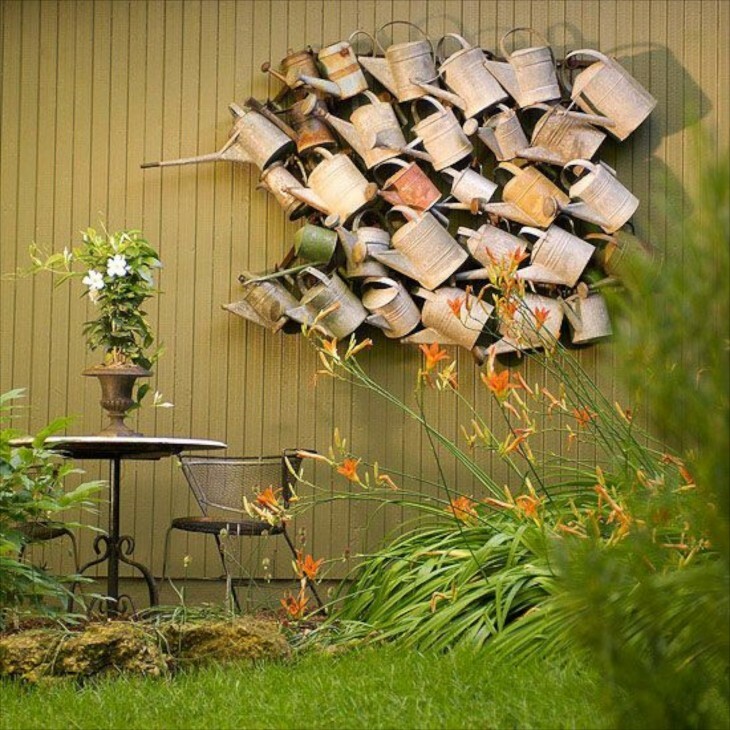 Living sculpture like this is fun, whimsical and serves up interest in even the smallest of spaces. Here again, we have a small space, which would still be boring. 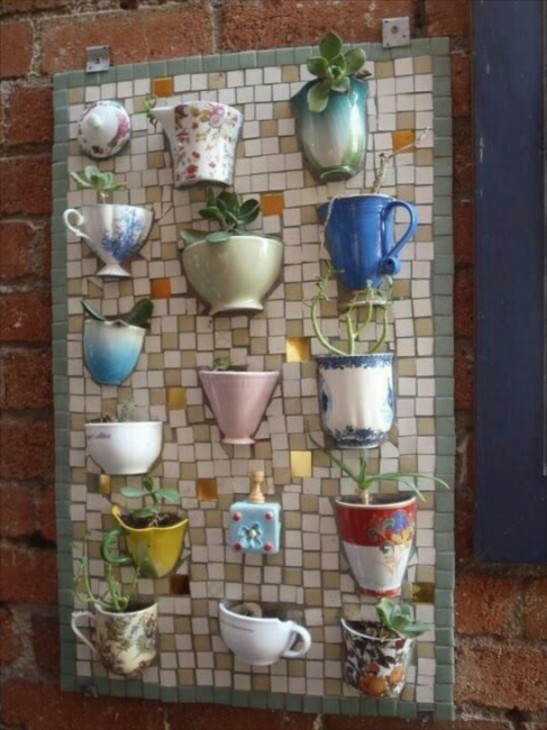 With a little imagination, this person recycled some cups and mugs onto a mosaic and created tons of fun in a tiny space. Look here and think how totally uninteresting this wall would be without these simple additions. 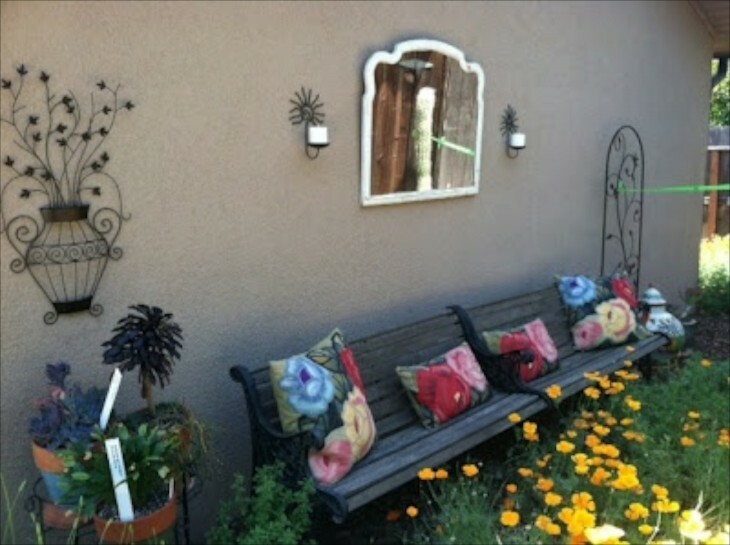 Instead of scattering the furniture around the yard, concentrating them along the wall, with the addition of a few colorful pillows and a mirror, almost calls to you to come and sit a few minutes. 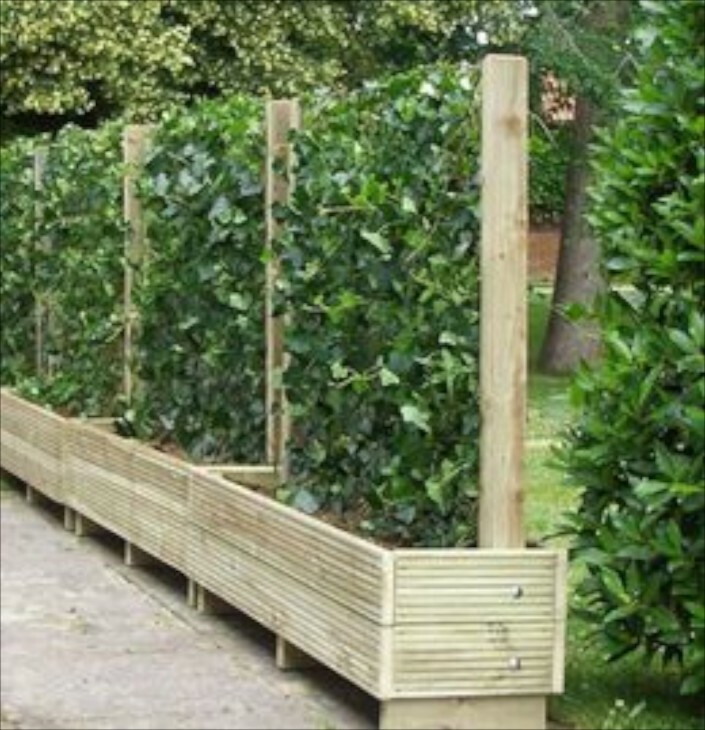 In a long expanse of wall, or along the side of a garage or side of a house, the addition of a single area of espalier like this can create a far more interesting connection between buildings and gardens. 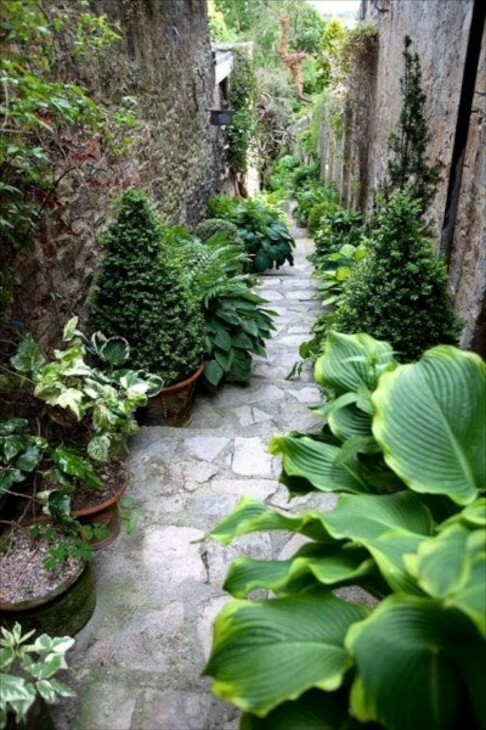 Although I am not wild about the white stone and pavers, this is still a good example of how a narrow space between two buildings can be transformed by greenery. 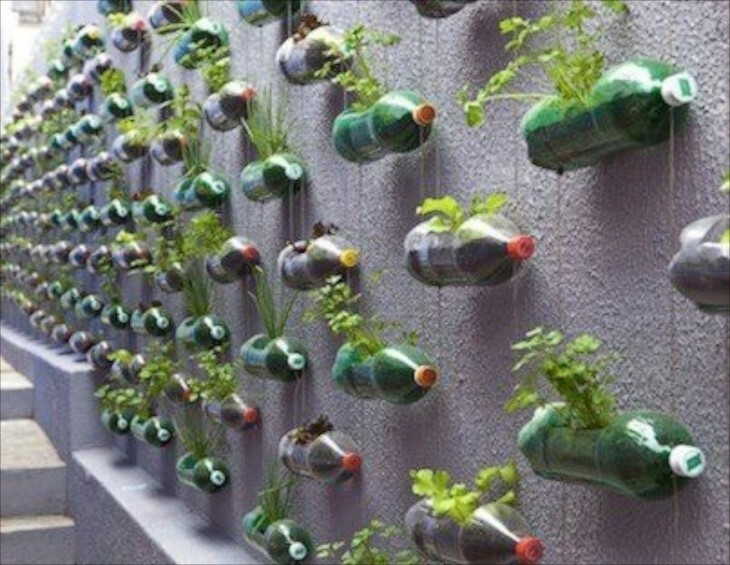 Talk about recycling! This is so interesting. The variety of color in the plastic bottles and caps and their shear numbers makes this so cool. Imagine entering the space as you walk towards the door. 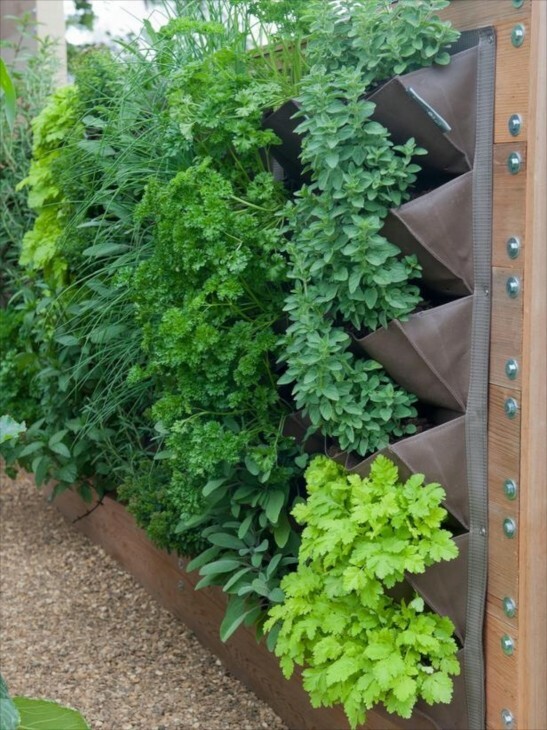 All these herbs growing in a vertical space when there is no lawn area. Original! 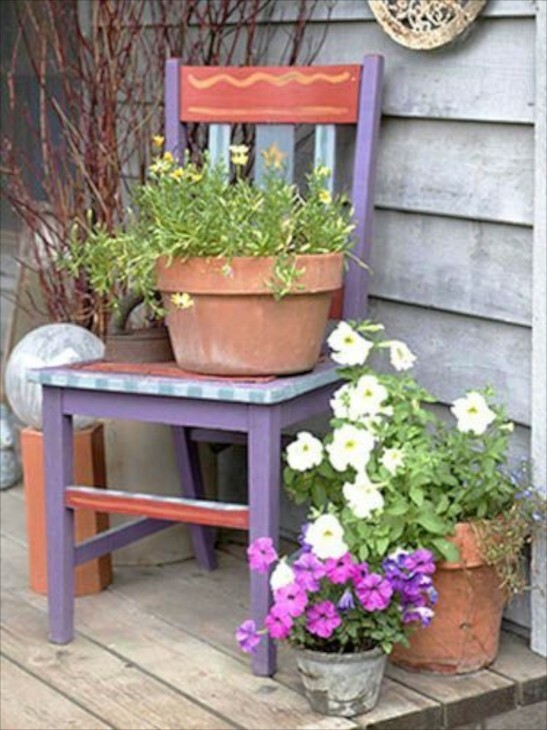 If you have a wall or side of a building, even placing a colorful old chair and a potted plant breaks up an expanse of boring. 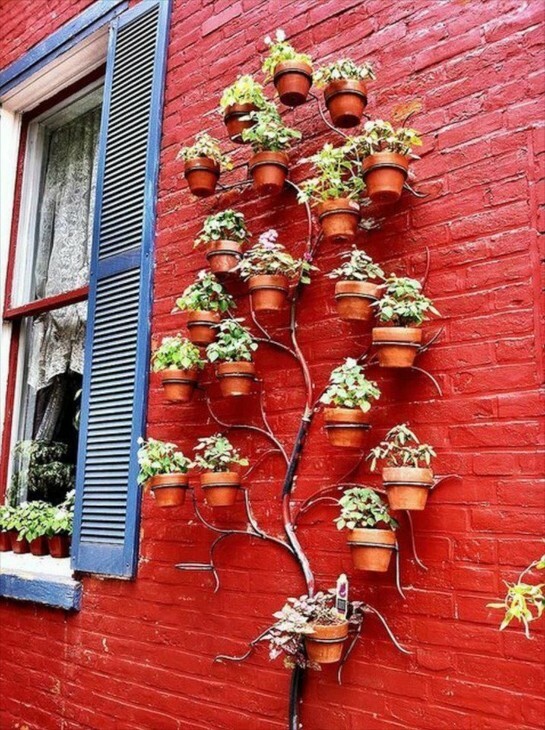 This owner decided to not just decorate the wall, but to also paint the wall with a bright color to serve as a background for an old door and potted climbing vines. 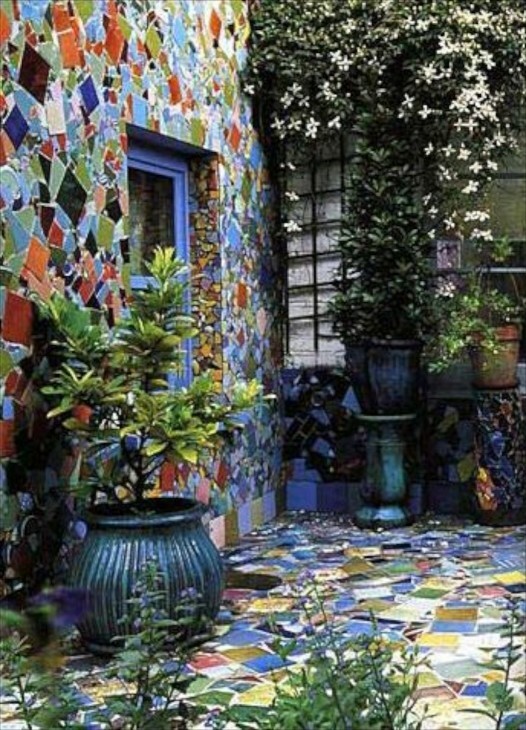 The mosaics in the gravel path add even more fun. 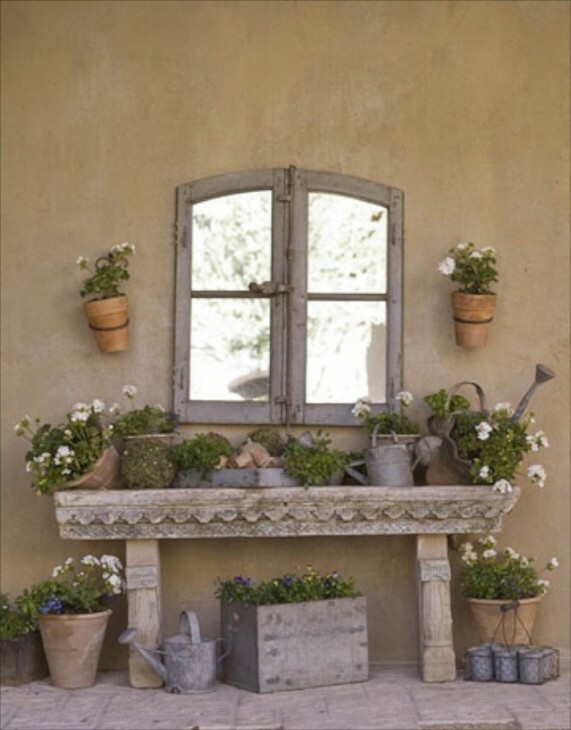 This is such a delightful combination for a vignette along a wall. 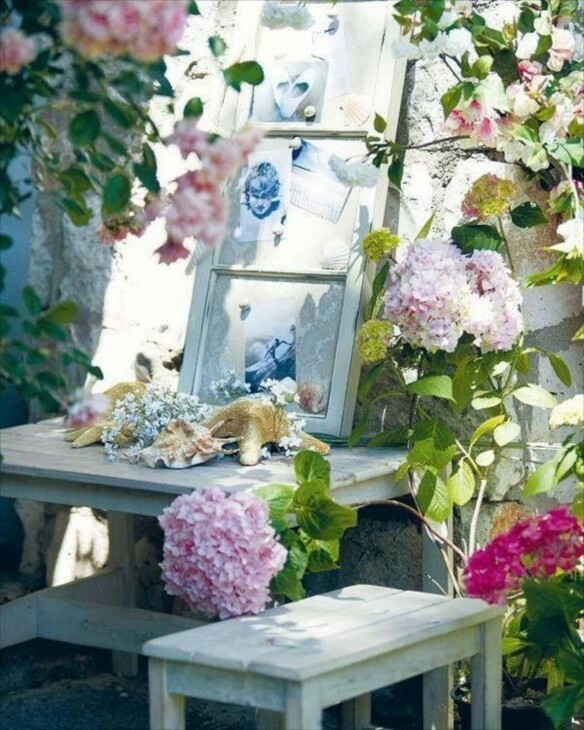 Pinks and blues combine to lend a sweet, cottage feel to a leaning old window transitioned to a bulletin board and decorated with blue colored photos. The seashells and starfish add decorative fun and interest. From cottage to modern, this wall is transformed by the addition of a sleek and contemporary box with uplighting that must surely be dramatic at night. The texture and desing of the black wall implies movement. The fountain to the left adds the wonderful sound of water. 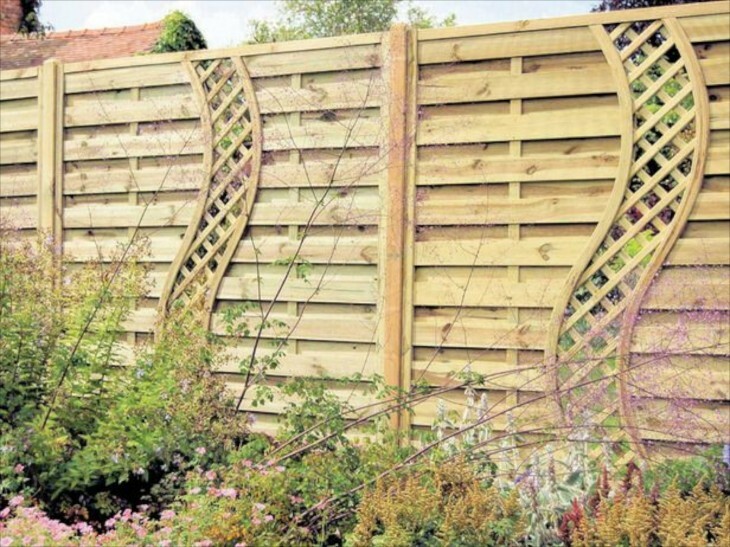 No boring fence connecting spaces here! 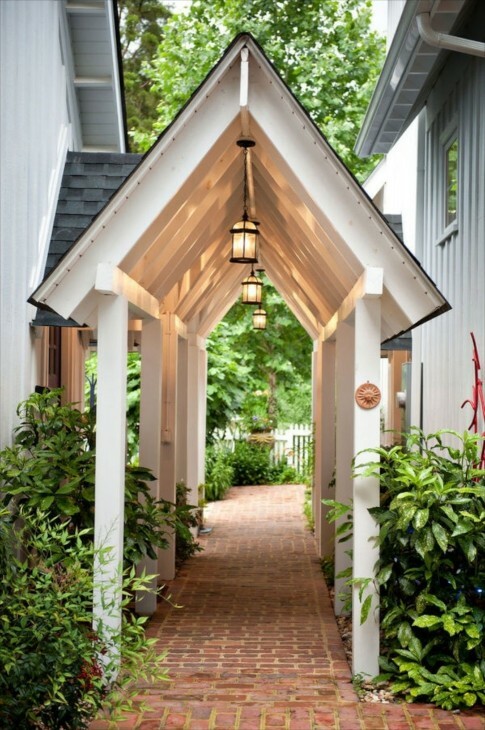 A bit more complicated, but a wonderful way to connect two buildings and create a welcoming entrance that leads to both. The plantings on each side soften the edges and the lights in the ceiling must be lovely at night while adding visual interest to this structure. And if all you have is a small corner or short expanse of fence, you can still pretty it up. Color blocking the fence here really works, especially because the house behind it is a cream color. 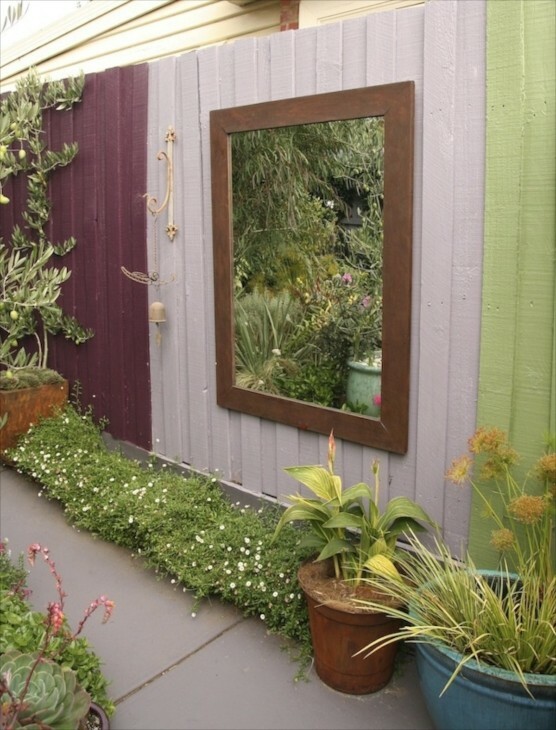 The mirror reflects back the garden space making it appear bigger than it is. I love using mirrors in the garden. They are unexpected, yet they work. This is one of the most creative ways I have seen in a long time to break up a tall and long fence. It implies movement, which breaks up the hard rigid surface of a long fence. A bit of whimsy…..almost seems like a group of folks all heading to the garden with a purpose. Love it! The addition of the small table and chair grounds it. Informal plus formal. Effective and very cute. 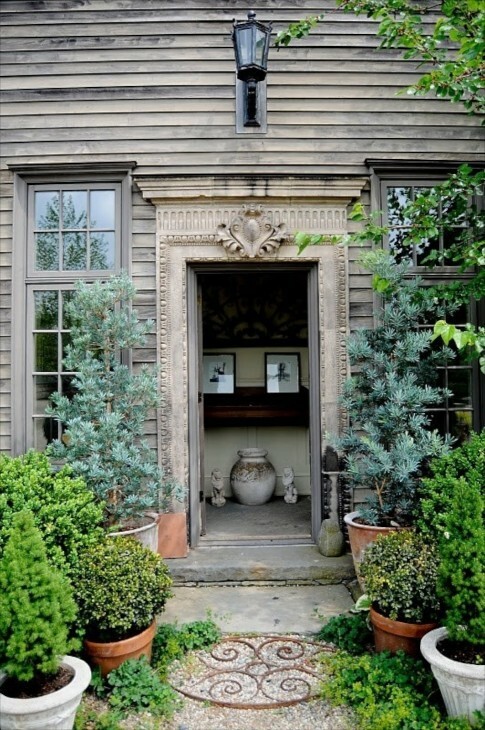 I am not sure this really qualifies for the intent of this post, but I just love New England, and I just loved how the use of a long row of pots on each side of the walkway leads one to the beautiful front entrance. I love the colors as well….the blue of the evergreen and the gray of the house, and how they combine. 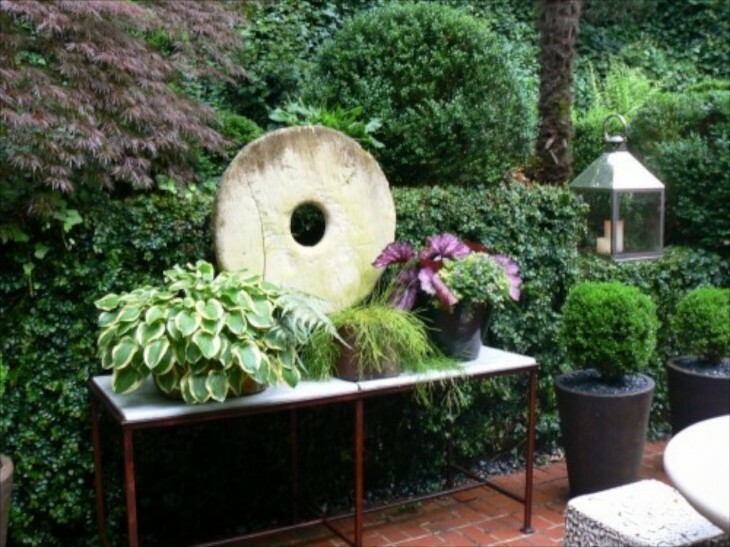 Using a large circular iron plant stand in the gravel walkway is clever. I use a black semi-circle one on my front stoop and I love it. Wood and vines always work well on stone walls. This is organic and interesting. I can almost smell the honeysuckle vine! This space would be beautiful even without the table, but the decorated table vignette makes it outstanding. I love how they placed the large lantern back and away from the table. And the last example…….what a pretty colored wall, but it would be nothing without the tablescape and the reflective window mirror. Thank you for the beautiful ideas. I was thinking about items I already have in my home to display with flowers, so this was really helpful. The small areas were made to look a lot like another room to the house where you could come in and sit down and enjoy. I hope your still writing. I enjoyed looking down through the pictures and placing myself into the walkway or viewing from my own deck.They are lovely. Gave me some great ideas to hide a miserable neighbor. Wow, I am longing for summer now! Gorgeous. These photos made me smile ear-to-ear! 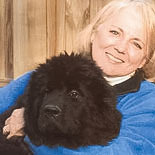 Jenny, Sorry for the delay on thanking you for commenting. I enjoy hearing from readers of my posts. I am back writing again and hope that you will come back and visit the blog again soon. All of them have wonderful ideas! Thank You for sharing. SORRY Emma, I was relying to another comment and thought I was replying to them, but it was yours, to which I had already applied when you commented! I know I am tired when I do things like that. Enjoy your weekend…..